First Annual Charity Tournament to benefit Linn Benton Food Share. 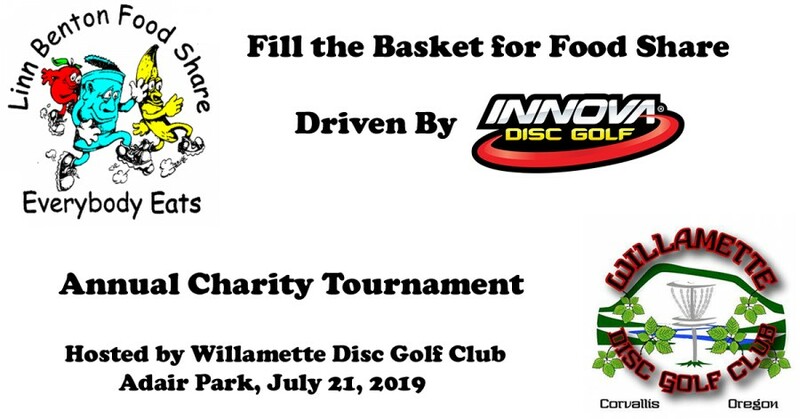 All proceeds from the tournament will go to the food share. REGISTER BY JUNE 17 TO GUARANTEE YOUR SHIRT SIZE SELECTION! Amateur players packs will include a disc (premium plastic), a 100% cotton T-****, a hat, a DewFly towel, and a couple other small items. Pros will have the option to purchase a player pack. This will be a two round event. Ace pot goes to Food Share if not claimed with an Ace. Linn Benton Food Share is a nonprofit 501(c)(3) organization of Community Services Consortium (CSC), and directly into the local communities. As the regional food bank for Linn and Benton counties since 1981, Food Share has been committed to fulfilling our goal that "Everybody Eats." Linn Benton Food Share collaborates with 74 member agencies to bring food directly to those who need it most. 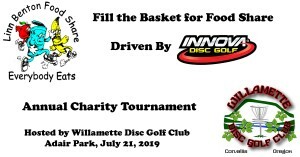 Willamette Disc Golf Club is responsible for all refunds and cancellations.